Ever heard of Tanja Feichtmair? She plays alto. Ever heard of Uli Winter? He plays cello. Ever heard of Fredi Pröll? He plays drums. 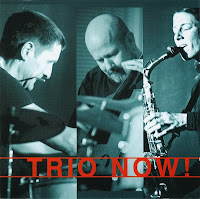 Ever heard of Trio Now!? Well now you have. And don't forget these musicians. I must admit: I had heard of them through their previous album "The Zipper" with Josef Novotny on keyboards and electronics, one of those albums that have been balancing on the review/no review edge, but then unfortunately didn't. But what Trio Now! brings us here is absolutely and without hesitation worth sharing. In the best of free jazz tradition, full of energy and power, with relentless blowing and dito rhythm section, in a very European way, think of Paul Dunmall, think of Frode Gjerstad, balancing between lyricism and free improv, and basically blending both, resulting in raw intensity and energy, sometimes going utterly explosive as on the long "Walter", in which the careful and somewhat seeking built-up erupts after eight minutes as one common force. "The Gift" is again more jazzy, with longer phrases over a fierce rhythm section. But then suddenly the atmosphere changes into the barely audible "Free Eggs", in which all three musicians create a collage of diverse notes and sounds, with silence being the main instrument, flanked and nudged by the sax cello drums yet ever so lightly, only towards the end gaining momentum and volume. The best track is the long "Now! ", the opener of the album, and a strong powerful word of welcome to a new audience, showing the trio at its best, coherent, focused, energetic and lyrical. The worst track is the last one "Over The Rainbow", which consists of the trio's infantile shouting of the well-known tune, and in my opinion plain silly. The album would have been better and more coherent without it.